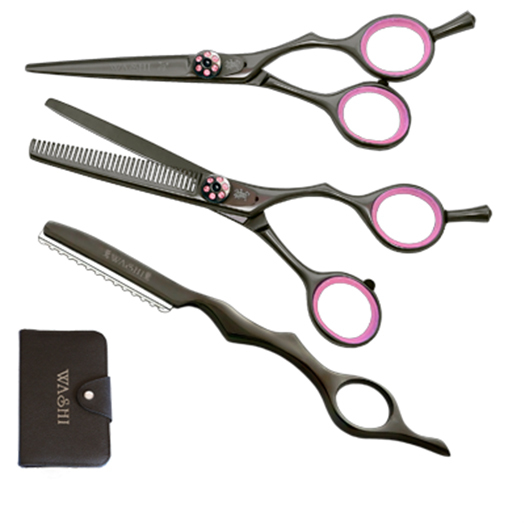 As beautiful as it is functional, this matching set features one of our best selling cutting shears! This Black Titanium combo is as beautiful as it is functional, and it features one of our best selling cutting shears! This perfectly balanced hair shear feels weightless in your hand and provides you with smooth and precise performance. The fine 35-tooth thinner handles detailing and finishes haircuts impeccably. In addition, the bonus texture razor rounds out the set giving you the right tool when a little wispy texture is wanted. Comes in a 5-shear case for safe storage and carrying.Save over $100! Order now!